B&H has the new Canon Cinema EOS C300 PL in stock - $15,999.00. Canon CPN has made Wireless File Transmitter Step-by-Step Setup Guides available for download. B&H sold out, but Adorama now has the Tamron 24-70mm f/2.8 Di VC USD Lens in Canon mount in stock. Free shipping. eBay (via Beach Camera) has the hard-to-find Canon EOS 5D Mark III Body in stock (normal $3,499.00 shipped price). Update: Please note that the 5D III ships "On or before Thu. May 03". They are not in stock. B&H has the new Tamron 24-70mm f/2.8 Di VC USD Lens in Canon mount in stock. B&H has the new Sigma 50-150mm f/2.8 EX DC OS HSM Lens in both Canon and Nikon mounts in stock. Wear it three ways. Load it two ways. The new Urban Photo Sling series from Lowepro offers street photographers and enthusiasts an easy way to carry and access their camera gear, plus a tablet. DayMen Canada, manufacturer and leading distributor of high-quality imaging, laptop and other electronic protective accessory brands, unveils its new Urban Photo Sling series. Inspired by the daily routines of street shooters, photo enthusiasts—even bloggers—these modern and compact slings offer versatile and comfortable carrying solutions. The Urban Photo Sling series features a profile that lends itself to three comfortable and secure wearing options: at the front, back or to the side. The design was specially constructed to make it easy to shift positions while on the move. Thoughtful storage details are featured throughout the design. A dedicated, padded compartment provides protective space for an iPad® or other tablet-style computer. A zippered front accessory pocket offers easy access to personal items. And side pockets provide grab-and-go access to a lens cap, filter, metro ticket or other small items. Two loading options add to the versatility of the sling. A photographer can load it from the top for easy access or with the front panel fully open for maximum organization. The interior features a padded and adjustable divider system for custom organization of gear. Additional features include: an interior keeper strap to safeguard lenses and accessories; a tuckaway waistbelt for stability, comfort and security; a contoured, mesh-covered top flap that serves as a moisture barrier; plus a built-in pocket to keep spare memory within easy reach. The Urban Photo Sling 250 fits up to a Pro DSLR without grip, with an attached 70-200mm lens; 2 extra lenses or a flash and 1 lens; a tablet; the side pocket fits a water bottle or small tripod; accessories and personal items. The Urban Photo Sling 150 fits a DSLR with attached 55-200mm lens; 2 extra lenses or a flash and 1 lens; a tablet; accessories and personal items, OR, a CSC with attached kit lens; 3 extra lenses or a flash and 2 lenses; a tablet, accessories and personal items. The Urban Photo Sling series is available in Black. For more information about this series, please visit lowepro.com/urban-photo-sling. 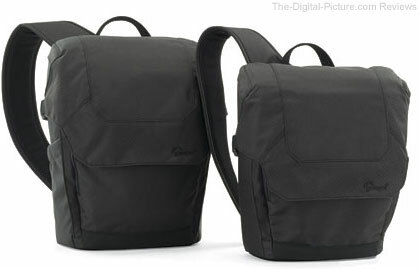 B&H is accepting preorders for the Lowepro Urban Photo Sling Series. Standard test results (and some product images) have been added Zeiss 25mm f/2.0 Distagon T* ZE Lens Review page. DayMen Canada announces the launch of Lowepro’s new technical, lightweight daypack that offers active outdoor photographers and enthusiasts on-the-fly access to gear. DayMen Canada, manufacturer and leading distributor of high quality imaging, laptop and other electronic protective accessory brands, unveils its new Flipside Sport AW series from Lowepro. These two technical packs incorporate body-side access, a removable camera compartment, all-weather protection, plus lightweight carrying comfort. A compact, low-profile shape allows the wearer to move with ease when running or hiking on an alpine trail or exploring challenging terrain on a mountain bike or skis. Perforated and breathable padding with air channels is strategically placed at the back panel and shoulder straps to provide comfort and moisture wicking at the back and shoulders. The unique, body-side access design provides an easy way to get to gear without having to remove the pack. To create more flexibility for outdoor photographers and adventurers, the design team constructed a removable camera compartment. It includes the classic Lowepro adjustable and padded divider system, but with an inventive twist: the entire compartment may be removed, securely cinched with a storm-flap closure, and put in a safe place while the pack is converted to a fully functional daypack. Built-in details add comfort and convenience for a day of outdoor activities. The packs feature a hydration-ready side pocket with space for a 1 liter reservoir (not included) and easy-to-reach port for a sip tube. An ultra-secure tripod attachment system at the side of the pack helps expand the carrying capacity—it accommodates a range of compact tripods or monopods, and helps compress the overall size of the pack. Additional, outdoor-friendly features include: lashes for trekking poles/ice axe; a zippered pocket inside the back panel; multiple adjustment points for a custom fit at shoulders, sternum and waist; Lowepro’s patented, built-in All Weather AW Cover™ to protect gear from the elements; and lightweight, resilient and high-performance 210D triple-ripstop nylon with PU coating for improved durability. The Flipside Sport 15L AW fits up to a Pro DSLR with grip, with attached 300mm f/2.8 lens; 1-3 extra lenses or flashes; a tripod or monopod; 1 liter hydration reservoir; cables, memory, manual and extra accessories. The Flipside Sport 10L AW fits a DSLR with attached 70-200mm f/2.8 lens; 1-2 extra lenses or flashes; a tripod or monopod; 1 liter hydration reservoir; cables, memory, manual and extra accessories. 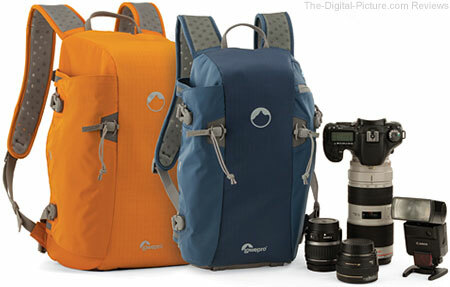 Available in two colours: Lowepro Orange with Light Gray accents and Galaxy Blue with Light Gray accents. For more information about this series, please visit lowepro.com/flipside. B&H is accepting Lowepro Flipside Sport preorders. Tamron has posted 1Q 2012 Financial Results (PDF). The Tamron 24-70mm f/2.8 Di VC USD Lens is now shipping in the USA. I have a ship notice from B&H. I would like to create a full Tamron 24-70mm f/2.8 Di VC USD Lens Review, but will minimally commit to capturing a full set of standard test results from it. Adobe Photoshop Lightroom 4.1 Release Candidate 2 is now available for download. Estimated price does not update when switching between books in the Collection panel. Postscript Type 1 Fonts do not appear in the Font menu within the Book module. Filenames can be used as auto text captions within the Book module. Fonts such as Courier New and Times were not displaying properly on books exported as PDF files. The Adjustment Brush pin would not properly accept negative values. Clarity adds grey tinting to 100% white tones. Creating a soft proof does not add a line item to the History Panel. Photos with GPS Altitude data will now properly display Altitude within Lightroom. Unable to import RAW+ JPEG files directly from Canon 5D, Canon 5D Mark II, Nikon D700, Nikon D90, and Sony NEX5 cameras when connected through USB. Unable to import RAW + JPEG files when using the built-in SD card reader on Macbook laptops in some scenarios. Lightroom 4 and ACR 6.7 render files differently. Learn more at Lightroom Journal. Adobe has made 28 short Photoshop CS6 Videos available on YouTube. Again, CS6 preorders are being taken at the Adobe Store. Hollywood, CA and Dallas, TX – Redrock Micro, the recognized leader in affordable professional-level cinema accessories, announced today the immediate availability of a new family of Redrock-designed follow focus units. The new microFollowFocus family is the third generation offering from Redrock Micro that delivers new levels of performance, a unique “back-to-new performance” adjustable gearbox, and a range of products that can match any budget or feature needs. At the heart of any focusing unit is precision performance. Redrock spent the last three years developing a new original-design unit featuring a completely geared, precision-machined transmission with virtually backlash-free performance. Recognizing that all follow focuses settle over time and are prone to develop play, all new microFollowFocus units include adjustable backlash, which can reset the unit’s performance to ‘like new’ condition at any time. The new gearbox delivers exceptional professional-level performance for a lifetime. The microFollowFocus | blue solves the issue that many filmmakers face when filming with HDSLR lenses: the focus ring spins freely, making repeatable focus nearly impossible. The microFollowFocus | blue solves this with an ingenious adjustable 'hard stop' mechanism on the follow focus itself, so every lens now has hard stops. "Hard stops solve a big limitation of shooting with Canon EF lenses," said Ted Coates, DP and owner of Moving Pictures, Inc. "I now have a tool that allows me to shoot with DSLR lenses with a similar level of confidence as traditional video lenses. " The new microFollowFocus line offers additional features for DSLR lenses including support for shorter lenses with its flippable gear box, and when paired with microLensGears gives DSLR lenses the ability to achieve accurate, repeatable, precision focus pulling. The microFollowFocus family is available in three different configurations and price points. The microFollowFocus | blue is Redrock's flagship product, with the features and performance for professionals and enthusiasts. The microFollowFocus | blue Studio adds a second side wheel ("studio" mode) for quickly switching camera sides, and can be added or removed at any time. The microFollowFocus retains the performance and core features of the flagship version at a more economical price. “Back to new” adjustable backlash that maintains precision performance for a lifetime. Adjustable hard stops for DSLR lenses. Reinforced, repositionable focus indicator for assistant or operator focus marks. Add a second side wheel (‘studio mode’) at any time, or switch between single and double sided. Works with both still and cinema lenses. Choice of follow focus unit to match your budget and performance needs. Confidence in gear that comes with lifetime warranty and is made in the USA. Incredibly affordable - starting at $595. All microFollowFocus products are available immediately from Redrock direct at store.redrockmicro.com and from authorized Redrock Micro resellers worldwide. The microFollowFocus introductory price is $595, the microFollowFocus | blue $795, and the double-sided microFollowFocus | blue Studio $1190. Get your Redrock Micro gear from B&H. I have posted the Canon EOS 5D Mark III Digital SLR Camera Review - Part 2. The primary updates to the 5D III review are the image quality comparisons closer to the beginning of the review.